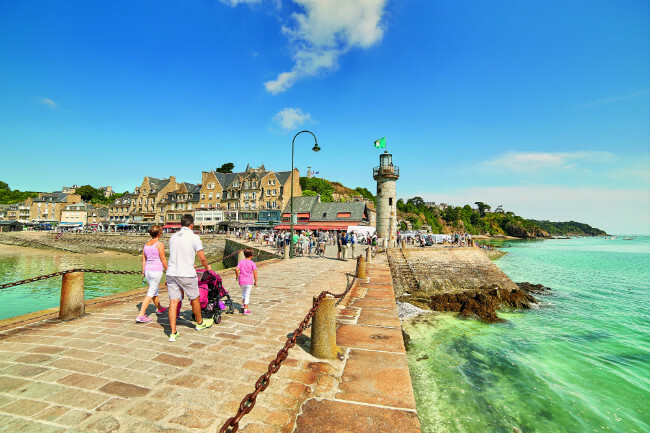 For many people arriving by ferry at Roscoff in Brittany, Morlaix is just a name on a road sign, the first major town on their journey through the region and beyond. 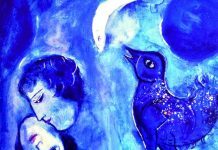 But this is a commune that is well worth making a stop for – even if only for a mid-morning break before continuing on your way. 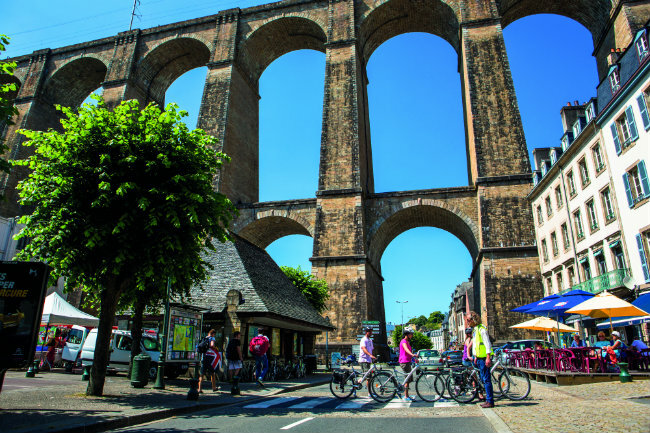 The vast 292-metre-long, 62-metre-high viaduct spanning the tidal port of Morlaix is just one of the giveaways that this is a commune built on the boom years of industry, when Morlaix laid claim to being one of the largest ports on the Channel. The charming, half-timbered 17th-century industrial buildings that line the quayside only reinforce this. Today many have been turned over as artistic spaces, providing a great mix of past and present. Take a step inside No. 9 Grand’rue, once the heart of the linen market, and now home to a beautiful example of a typical Morlaix winding staircase. Nearby the beautiful Maison de la Duchesse Anne – reputedly one of a number where Anne of Brittany stayed – offers a fascinating insight into 15th- and 16th-century merchant life. 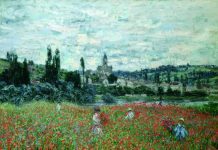 The Musée de Morlaix is also well worth a visit. 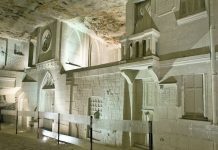 Housed inside a former Dominican convent, the museum has a varied collection of fine art, as well as traditional arts and crafts (while it is undergoing refurbishment, due to be completed in 2021, part of the collection has been temporarily relocated to la Maison à Pondalez nearby). 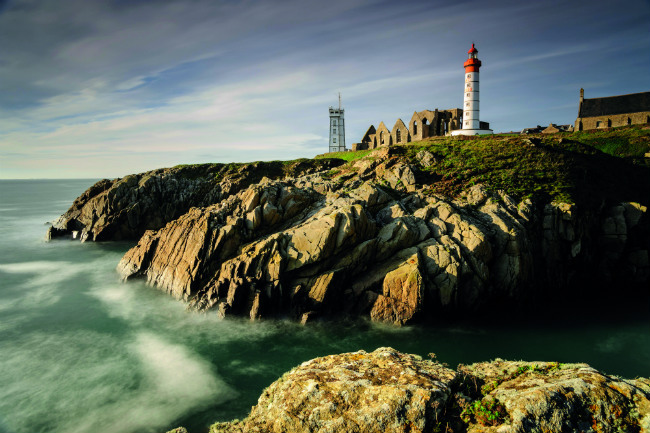 The Finistère département’s major city of Brest is found in the far west of the region – or World’s End, as it is known in Breton – and it is here that Brittany’s deep relationship with the coastline which encircles it on two frontiers can really be felt. 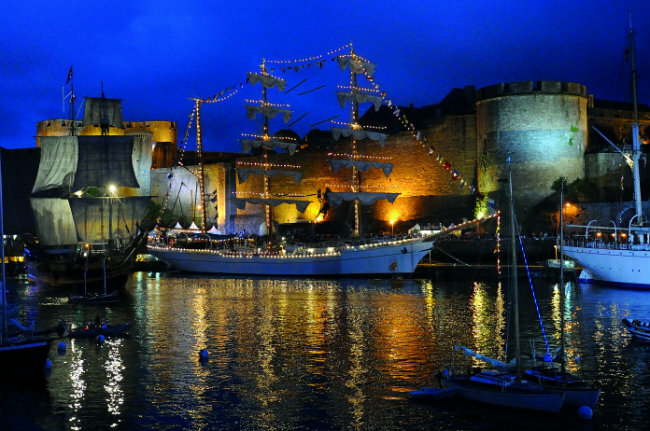 Since the Roman Empire it has been a port of military importance, and while Brest would never describe itself as a pretty city, having been completely rebuilt after the Second World War, it more than makes up for it in character. Like the town itself, the Musée des Beaux-Arts was all but destroyed during bombing raids, but the collection has since been rebuilt to include more than 300 pieces of Baroque art, including Guerchin’s Judith and Holofernes. 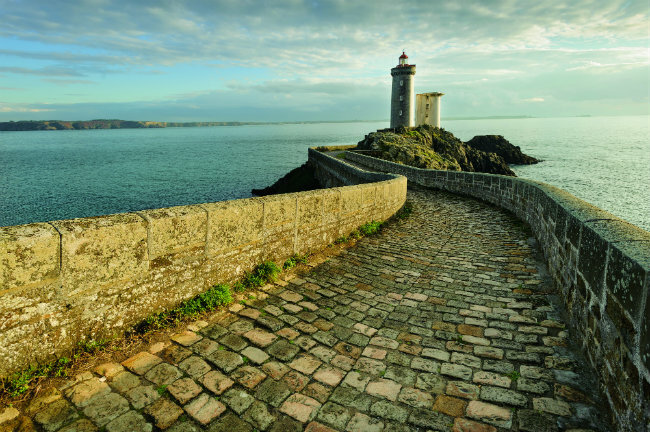 Exploring the town, you cannot fail to appreciate its naval heritage, which makes it an ideal location from which to explore Brest Terres Océanes’ coastline, and its most prominent manmade landmarks – the lighthouses. Impressive and majestic, to say the least, these solitary structures, often thrust out on a rocky outcrop, are towering symbols of this region’s turbulent relationship with the sea. You can climb the 365 steps to the top of the tallest lighthouse in Europe at Île Vierge, while at Pointe Saint-Mathieu the lighthouse jostles for prominence with the medieval ruins of the Abbaye de Saint-Mathieu on its craggy outreach – the westernmost point of mainland France – overlooking the Atlantic and the Bay of Brest. The lighthouses, many of which date from the 19th century, have been brought bang up to date with the introduction of a new augmented reality app that allows you to explore 19 lighthouses along a designated trail. Among those featured is the Phare de Trézien, somewhat surprisingly to be found inland, 500m from the shoreline, as well as the oldest lighthouse in Brittany, the Phare du Stiff. 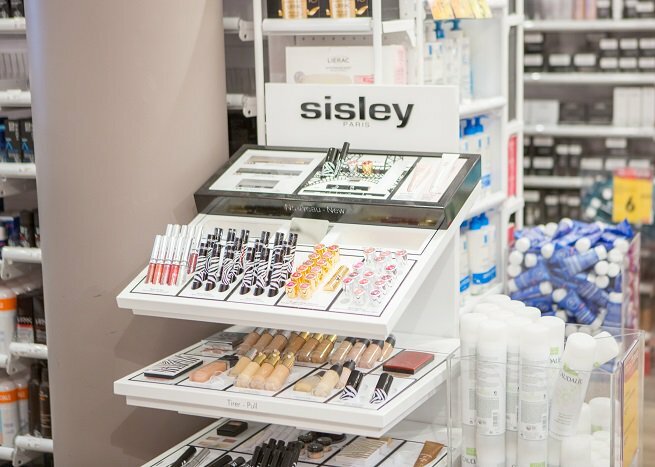 Further south in the département lies Finistère’s prefecture, which serves up a traditional slice of Breton life. 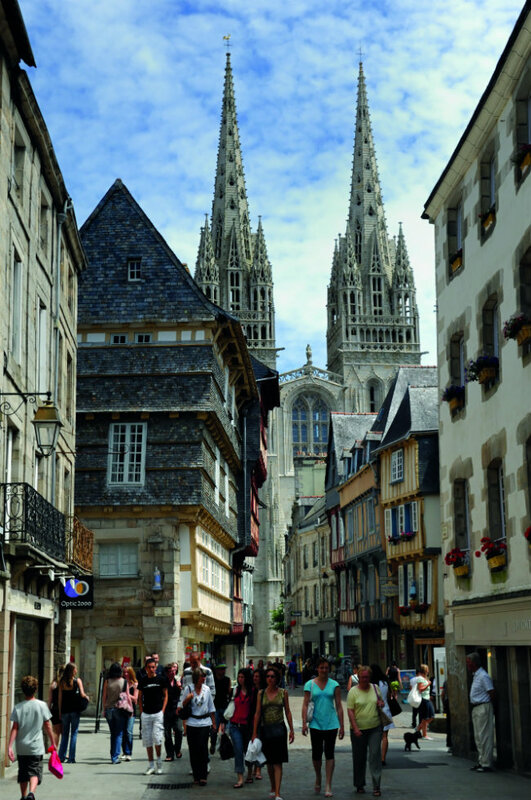 The towering twin spires of the Cathédrale Saint-Corentin set the scene in the historic town of Quimper, which has a distinctly Celtic feel to its medieval streets. 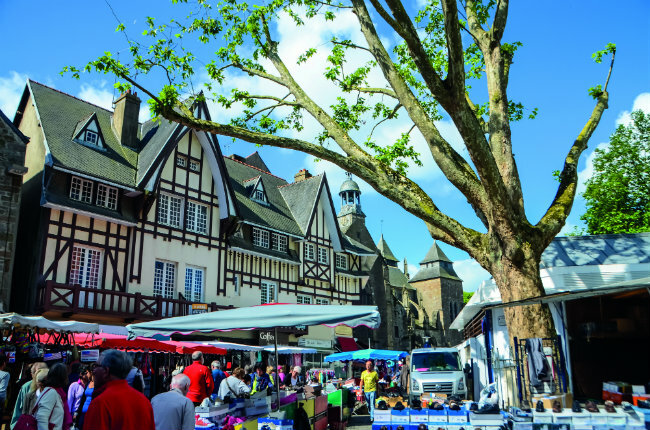 With names like rue Kéréon, place au Beurre and rue des Boucheries, you get an idea of some of the traditional trades that saw this town flourish. 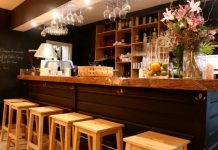 There is no better place to stop and enjoy a traditional Breton galette than at one of the many crêperies in this town’s charming streets – accompanied, of course, by a jug of cidre. 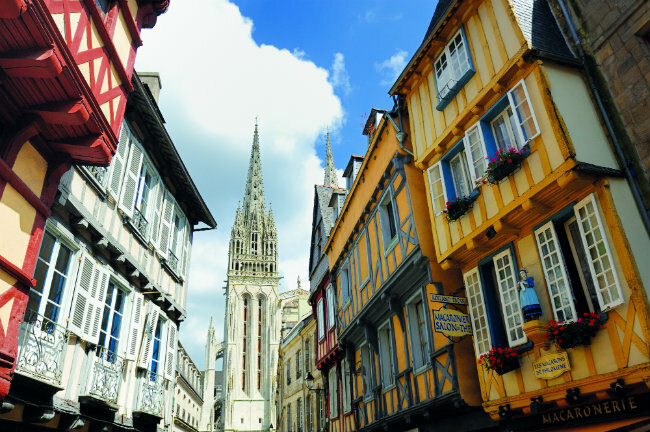 Largely known as the cultural heart of Brittany, Quimper’s streets come to life every July during Festival de Cornouaille, which has celebrated Brittany’s Celtic roots every year since 1923. Expect traditional dress, bagadoù performances and dancers spilling out into the streets, as well as the spectacular Great Sunday Parade during the week-long festival. 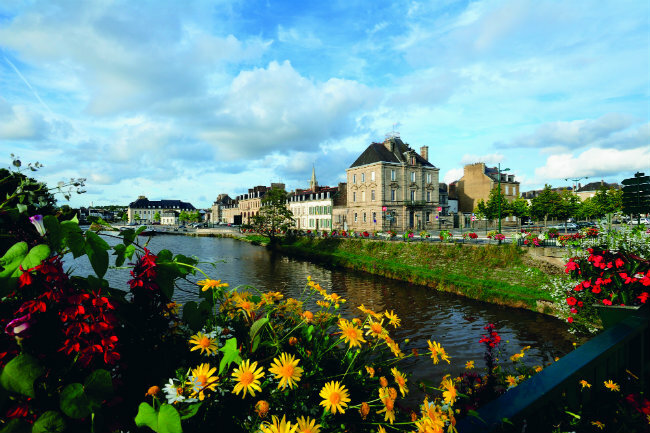 Pontivy is perhaps not the obvious choice of destination in a département with a scattering of beautiful islands lying just off its coastline, as well the largest megalithic monuments anywhere in the world. 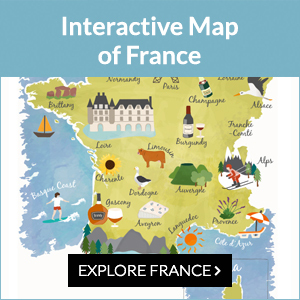 But this market town to the north of Morbihan has a history of men arriving and leaving their mark – and it shows. It’s famed as the family seat of power for the Rohan dynasty following their arrival at the small commune on the River Blavet in the 12th century. 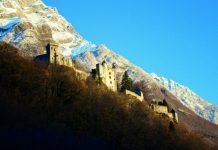 The town’s impressive château was built some 200 years after their arrival, and saw its fair share of turbulent times in the intervening years. Today it is open to visitors and hosts regular exhibitions and displays. 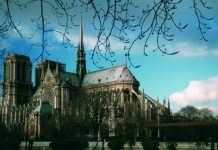 But it was some 600 years before the Rohans that Pontivy was founded by an English monk named Ivy who – according to legend – gave the commune its name. He arrived in 685AD at the River Blavet and built a bridge across it, subsequently leaving behind the Pont d’Ivy. The town’s strategic position on the river again led it to catch the eye of another powerful man, Napoleon, who extended the commune significantly in line with his vision of creating a centre of commerce in peacetime, and an integral military centre in times of war. This saw the town twice renamed Napoleonville, before reverting back to its medieval origins following the downfall of Napoleon III. Napoleon’s construction plans for the town have left a commune of two distinct halves: the medieval old town, with its timber-framed buildings and magnificent château; and the imperial new town, with its precision-straight avenues modelled around place Aristide Briand. That sense of dual identity is reflected right down to the town’s road signs, which since 2004 have been bilingual, featuring French and Breton. 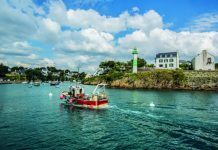 It would be wrong to visit Morbihan without exploring one of the many islands scattered off the coastline. Indeed, an old saying of Breton sailors was that he who sees Groix, sees his joy. 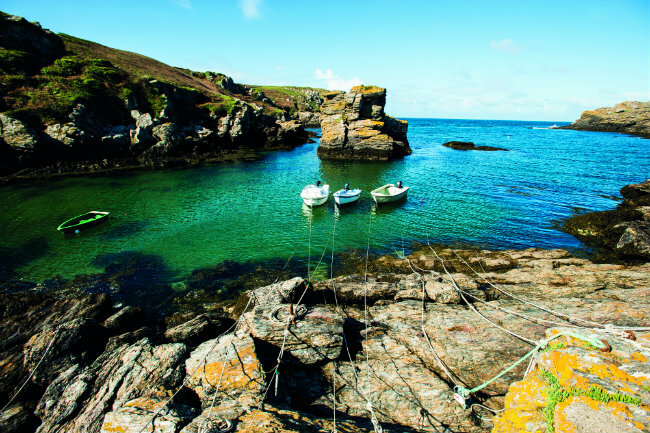 Île de Groix is just nine square miles in size, and its tranquillity is what sets it apart. The colourful houses in the main harbour village of Port Tudy overlook pleasure boats moored alongside. You won’t need a car to explore, but if cycling doesn’t quite fit with your idea of a quiet weekend, you can always hire an electric bike instead. That deep affinity with the sea is not unique to Brittany’s western coastline. The northern coastal commune of Saint-Brieuc brings all that is beautiful on land and at sea to this region and rolls it into one. Nestled in the heart of Saint-Brieuc Bay, this is where you will find graceful, half-timbered 15th-century buildings, leaning out over the narrow streets of the old town, an unusual cathedral that bears more of the hallmarks of a fortress than a place of worship, and more independent restaurateurs offering up local dishes than you could ever hope to dine in during just one visit. 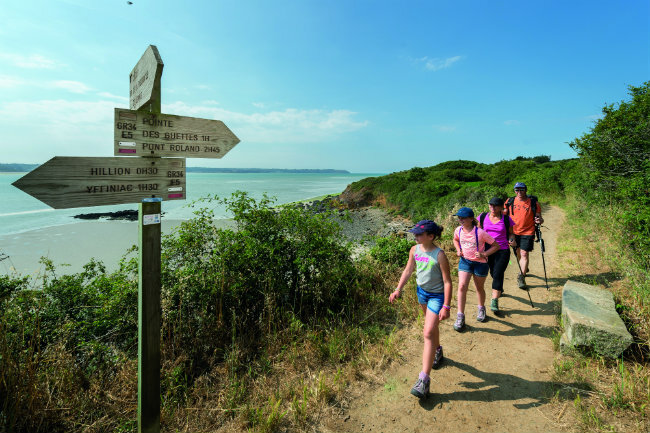 The Sentier des Douaniers (Path of the Customs Officers) takes walkers out along the coastline, taking in views over the dunes and the bay beyond, as well as the rolling landscape that encircles the commune inland. At low tide you can walk 7km out into the bay, which is positively teeming with wildlife. 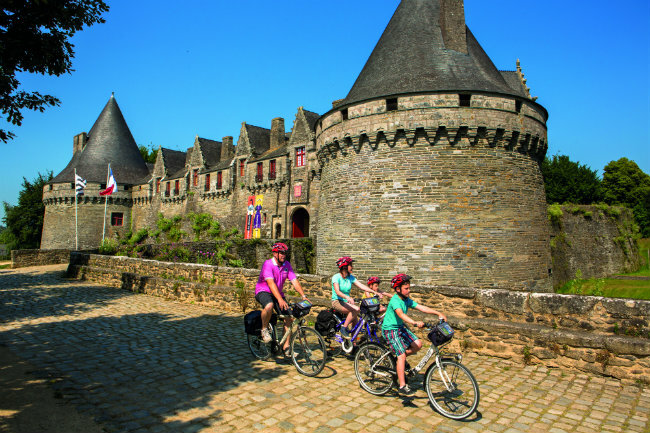 Just a short cycle ride away from the ramparts of Saint-Malo lies Cancale, an attractive fishing village renowned for its oysters. 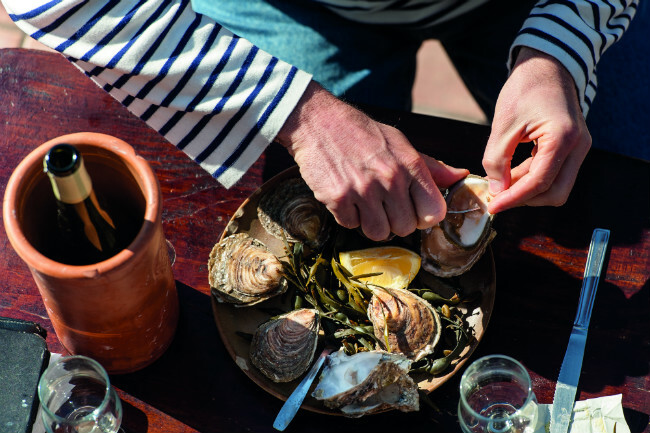 More than 15,000 tonnes of them are farmed here every year, making a visit to Cancale a must for any shellfish lover. 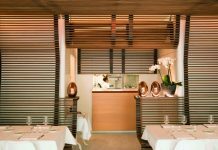 There are plenty of restaurants in the small village offering up oysters as fresh as they come; or to get hands on, you can book yourself into the kitchen of retired three-Michelin-star chef Olivier Roellinger for a cookery class. La Ferme Marine offers you the chance to learn more about how the oysters are produced and see a family at work in the bay. Even if oysters are not your thing, it makes for a fascinating visit. While there is no getting away from Brittany’s bond with the sea, or its agricultural heritage, it is by no means a sleepy backwater region. 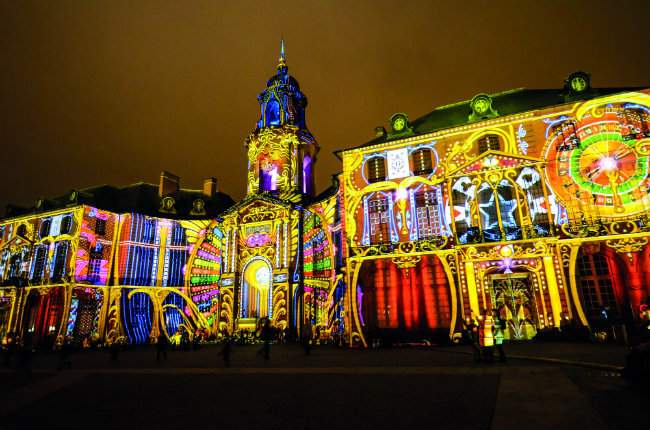 And a visit to the thriving university city and capital of Rennes will leave you in no doubt that this is a very forward-thinking region – it was one of the first cities in France to have its own dedicated TV channel! Much of the old city was all but destroyed by fire in 1720, although many examples of medieval architecture can still be found. 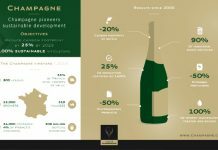 But it is perhaps some of the developments that have been conceived since this period that are the most eye-catching. Take the striking Hôtel de Ville, or Piscine Saint-Georges – beautiful public swimming baths opened in the 1920s and adorned with Italian mosaics created by the Odorico family. Or the Thabor Garden – laid out by Denis and Eugène Bühler – and home to some 3,000 different species of plant. 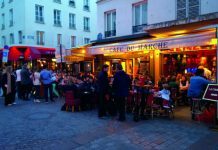 The city’s Saturday morning Marché des Lices is noted for being one of the finest in France. 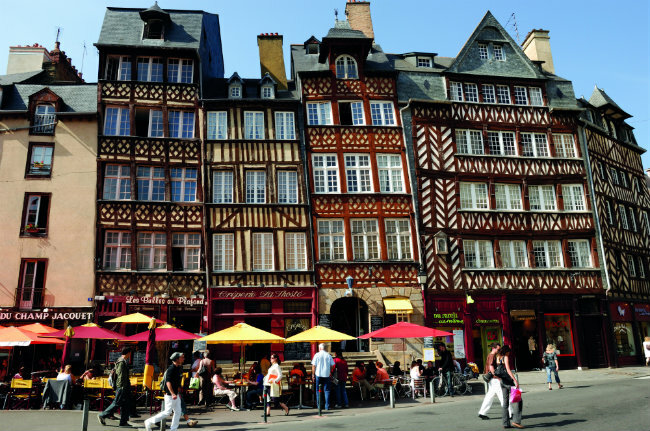 On a city break in Rennes, you will be sure to enjoy the very best that Brittany has to offer – and then some. 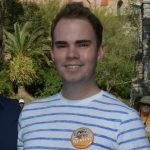 Stephen Davy-Osborne is a freelance features writer who fell in love with France from a young age during family holidays to Britanny and - like every other British child of the late 1980s - Disneyland Paris. Summers spent in Cannes and Nice sealed his fate and now his passport is well-used crossing back and forth The Channel. 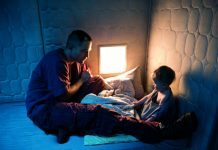 It’s great to see the north featured in articles like this as it is often overlooked. I have just driven through Picardy, and after searching online for interesting sights came across a TripAdvisor review in which a number of people more or less said: ‘there is nothing interesting to see between Calais and Paris’. I beg to differ. Yesterday we visited Pierrefonds and toured the magnificent chateau thre, the setting for the TV show Merlin’s Camelot. 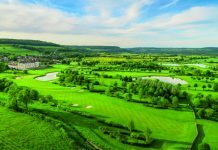 The town is idyllic with interesting architecture, a lake with paddle boats, beautiful walks and plenty of activities for all ages. 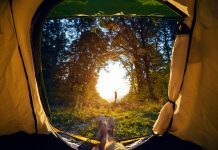 Best of all, it’s much more affordable than the cities, and much more relaxing. This is just one beautiful feature of the north, there are so many more across all the regions.